I’m not a gardener who loves to work in the garden. I love to enjoy the garden – sitting in the garden, walking around the garden, drinking in the beauty of the garden. So it was important to me to find a strategy for maintaining my perennial garden that requires a minimum of effort during the gardening season. This strategy, which involves a fairly big investment of time and energy early in the season when not much is blooming yet, can be divided into three basic steps. The first step is to weed the flower bed. I don’t do this until all my perennials are up out of the ground. I am beginning this year with the new fence border because it is the only flower bed that has neither hosta nor balloon flower (Platycodon), and those plants have not all put in an appearance yet. Sometimes I do spring clean-up just before weeding, raking fallen leaves out of the flower bed, cutting away old spent foliage, etc. What is important now, though, is to remove any weeds that have come up in the flower bed (like these grasses that accidentally got seeded here when my septic system was replaced last fall). If I can, I’ll weed after a rain when the ground is soft and yielding and the weeds pull up easily. At this point, I’ll also add any new plants, move any plants that have grown too close to their neighbors, and remove any volunteer seedlings that need to be relocated to a more suitable home. I snake the hose back and forth through the flower bed so that it passes by every plant. For bigger flower beds, I can connect two or more hoses end to end. 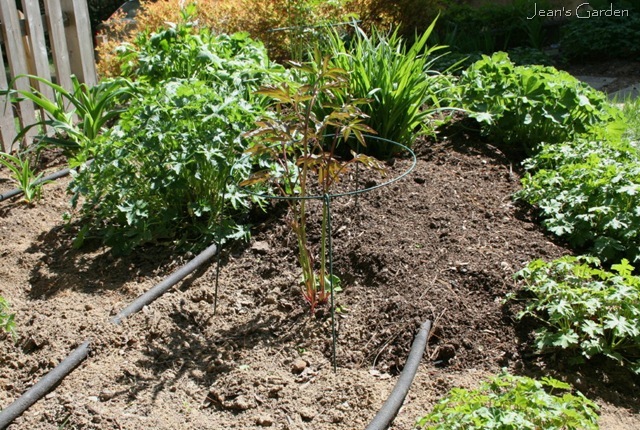 I don’t usually have any trouble getting the soaker hoses to stay where I want them; but in problem situations, landscape staples can be placed over the hose to anchor it in place. I make sure that I lay out the hose with the open end that will connect to the water source at the side of the flower bed closest to the house. I have two spigots on the outside of my house, one on the front and one on the back, and I have a long garden hose attached to each. 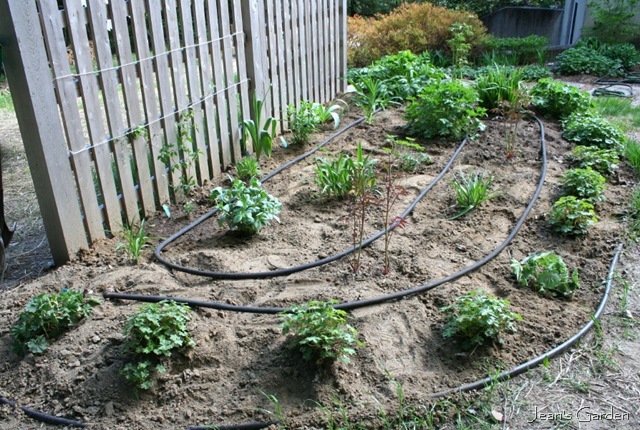 Every flower bed can be reached by one of these hoses, which is simply connected to the open end of the soaker hose for watering. At this stage of preparing my perennial beds for the summer season, I also put in any needed plant supports. I find that it’s easiest to put stakes in before I lay out the soaker hose, but I insert peony hoops after the hose is in place. The final step is to cover all bare ground and the soaker hoses with mulch. Because my sandy soil tends to be low in organic matter, I use compost as mulch; the compost gradually works its way down into the soil over the year, adding precious organic matter. My one-person household can’t possibly produce enough compost to meet my needs, so I order it by the truckload from a local nursery. Happily, commercial compost is readily available in Maine, where it is created from the waste products of three important Maine industries: agriculture (manure), forest products (wood chips and sawdust), and seafood (shells and other uneaten mollusk and fish parts). I spread the compost about 3 inches deep, which means that a cubic yard of compost will mulch about 125 square feet of perennial beds. It’s important not to get compost in the crowns of the plants, so I find it easiest to pile compost in spaces between plants and then get down on my hands and knees to spread it around, keeping it away from direct contact with the plant stems. 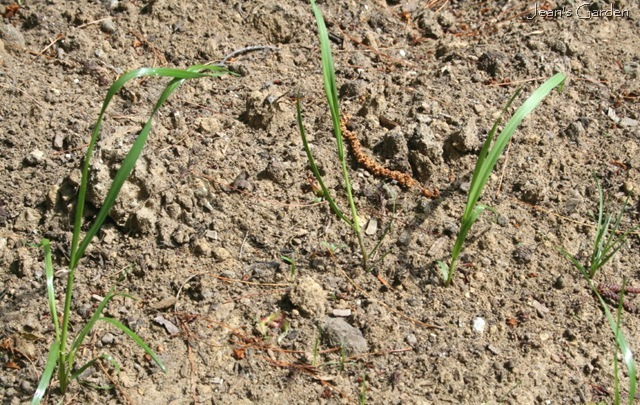 The thick layer of mulch both suppresses weeds and keeps the soil moist. I don’t expect to weed again until next year at this time, and I will not have to water very often. If it has not rained recently, I will turn the soaker hose on at low pressure for about an hour after I finish mulching to get moisture down around the roots of all the plants. If we have extended periods without rain during the summer, I will water each flower bed once a week. If we get at least one good soaking rain during the week, I won’t water. In a typical summer, I will water each flower bed once or twice a month. Unless I’m digging new flower beds, I won’t do much garden work for the rest of the garden season – just deadheading, hand-removing some harmful insects (like Japanese beetles and aphids), and cutting flowers for the house (hardly work). This system gives me what I consider the best of all possible worlds: neat looking flower beds full of flourishing, healthy plants and lots of time to enjoy them. Looks like the perfect recipe for a low maintenance perennial border. We can’t always make all of our compost either. We have found some compostable materials locally through various freecycle type organizations. Through those we found a couple of local stables who are only too happy to contribute to anyones compost…for no charge! Jean, A good play-by-play, though I have to admit that my “weed” picture would look a lot more weedy! I also use the same soaker hose system and mulch. For areas that span between garden beds, my handy husband has spliced together sections of regular hose that run between the soaker sections (think soaker hose dots and plain hose dashes) using couplings. That way, a single spigot can water a number of beds without wasted water. It’s nice to know that there are other gardeners who love the enjoyment part, but not the work quite so much. The 2 places I am very lax is fertilizing and dividing perennials. Very good strategy Jean! What if some weeds grow in/on that yummy compost? Let’s say the weed seeds were brought by wind and landed on the compost? will you do weeding? Great post Jean! I love soaker hoses also; my hydrangeas would never survive without them. Do you have a preferred brand or way of staking them in to position? I’ve used pieces of bent wire hangers to keep the hose where I want it. I wish I could get myself that organized, it does seem like it would save a lot of time watering. By mid August I’m so tired of watering that I start getting lazy and my plants suffer. More time to actually enjoy the garden is something we all need. 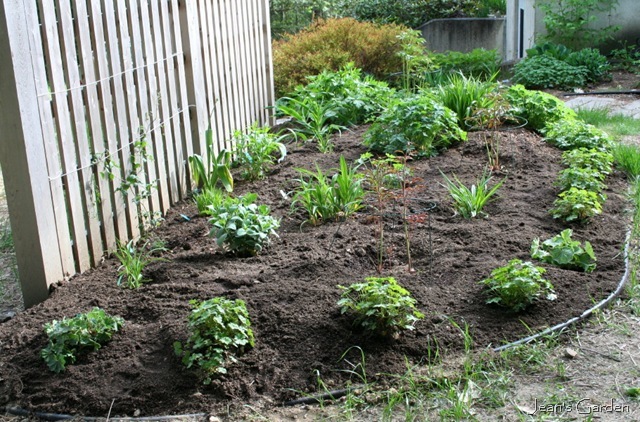 My “new year’s resolution” for the coming spring: mulch mulch mulch – against the weeds! Hi Jean – great advise. Although I must admit that weeding seems to be a yearlong project in my garden. I never seem to be able to keep up with them. Nice system you’ve got there. I do something similar, but spread the compost a little thinner and then lay on an inch or so of wood chips (free from my municipality), which helps discourage weed seeds from germinating in the lovely compost. You have to be careful, though. I’ve found that too thick a layer of wood chips encourages slugs. I’ve also found that the more I plant natives, the less watering I need to do when they begin to mature–though I might get more rain than you do. BTW was delighted to see your face, instead of The Nameless Grey Flower, I was getting used to on Blotanical. I can again see whose post I am reading. I envy you truckloads of compost. We must make do with barrows of horse manure and bales of straw. Hello Jean, I like your idea for irrigation. We’ve had such tight water restrictions over the last few summers that we have not been able to do anything except a little hand watering. If those restrictions ease this looks like a good solution for getting the plants the water they need via a good soak under mulch without being wasteful. I will have to write it down so I don’t forget! Sounds like you have it down to a science. I like how you put your soaker hoses down with the mulch on top. I have several beds that would benefit from that. A lot of my natives are becoming established which is nice to have less watering. Great post, Jean! Weeding after rain is always easier. I try to get a lot done in the fall, but the weeds are always there. I have mulched with compost, too, and it works wonderfully which is a mystery to me because you would think weed seeds would love taking root in that compost. Maybe it just takes time. Impressive system Jean! Now you will be able to just walk around and drink in the beauty. Ah, to be so together and to have such rich compost available! I did get the compost (only cow manure) in and around many of my plants this spring but the weeding is so impossible here. I know there are a ton of seeds in my compost, but nothing competes with bishops weed. I look forward to seeing your garden bed fill out and bloom. Wow, sounds like an excellent system, Jean. I’m impressed! Hello Everyone, I’ve really gotten behind on responding to comments in the past week or so; so I’m going to try to do them all at once. Gloria, Rebecca and Amy, What I really like about putting the soaker hoses under the mulch is that it keeps the water down around the roots of the plants rather than having a good portion of it evaporate from the surface. Clare, Free manure is pretty hard to come by around here because the local farmers sell it to the commercial compost companies. There’s a big composting operation a few miles from my house, and a common sight here in spring and fall is local farmers hauling trailers full of manure behind their tractors, on their way to Jolly Gardener. Tatyana, You raise a good point about the compost; but, like Commonweeder, I really haven’t had a problem with weeds seeding themselves in the compost. Pat, do you think it’s because our growing seasons are pretty short? Any seeds that land on the compost don’t really come up until the following spring, when they get weeded. Helen, LOL, I would have expected this flower bed to be weedier, too. I think the 4″ of “loam” that the septic system contractor put down when they finished had cement as one of its ingredients! It has a hard crust on top that the weeds may have had trouble penetrating. Maybe, now that I’ve disturbed the crust by weeding, the weeds will start coming up! If so, I hope the mulch does it’s job of keeping them under control. What a clever system your handy husband has created. I, alas, divorced my handy husband 30 years ago, so I’m limited to my own levels of handiness! Linda, I mostly haven’t had trouble keeping the soaker hoses in place; the mulch on top seems to help them stay put. When I have needed some help (more with the flat soaker hoses), I’ve used landscape staples. Using coat hanger wire is very clever, though; it would help me to recycle some of those coat hangers that seem to reproduce in my closets! Rebecca and Wiseace, I suspect that there are many of us that prefer to sit in the garden than to work in it! Rebecca, I’m also bad about fertilizing. Dividing is a little easier for me, because I’m still creating new garden areas and often have places where I want to put those divisions. Catherine, Although I often envy you your long gardening season, I think I would be a bit overwhelmed by it. We had temps down in the twenties last night, and things don’t really get going here until June — and by August, the garden is starting to wind down. Jack and Heather, I think “mulch, mulch, mulch” is probably a good strategy for keeping the weeds under control. Jim, I think my compost is a lot like your sweet peat — except without the peat. Soil here tends to be pretty acid (all those pine needles and oak leaves), so I don’t need to add acidity by using peat. Adrian and Heidi, I have to admit that I’m lucky in not having to worry a lot about water use. We get a fair amount of rainfall here. And because I live in a rural area without pavement and with a well and septic system, the water I use pretty much gets recycled. What the plant roots don’t take up gets filtered back down through my sandy soil into the water table. Household gray water goes out to the leaching field, where it gets filtered down through layers of rock, gravel, and sand back into the ground water system. Carol, Rosie, and Joey, I’m very lucky to have good quality compost available at a reasonable price. When I first started my small garden in Pennsylvania, I was surprised to find that I couldn’t buy bags of compost at my local nurseries or garden centers. 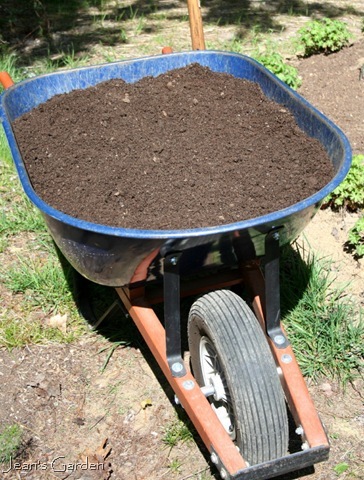 My substitute there is to mix bark mulch with composted manure. Nice work Jean… You guys are doing a greatt job there and over here too by sharing here to aware other. Your soil sounds like mine. Sandy, in country with lots of wind. Want to try your way. Mary, Let me know if this works for you. If you have a source of good compost, I find using it as mulch a great way to replenish the organic matter that keeps leaching out of the sandy soil. Beware, though, of inferior compost. One year I bought a truckload of compost from a local nursery that hadn’t been fully composted and was full of seeds. By mid-summer, my flower beds were overrun with weeds; I even had squash plants growing in my flower beds. Me too, I love to enjoy the garden – sitting and walking around the garden…just appreciating the beauty around me. Thanks for sharing your Low-Maintenance Perennial Garden Strategy-weed,water and mulch. I’ll definitely try that. Since we’re on the topic of perennials,you might want to read about the different Types of Perennials & How to Grow Them at http://www.howdoesyourgardenmow.com/perennials/ .